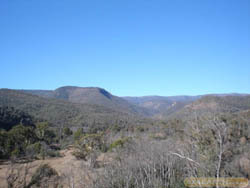 This track runs off Link Road (between Cabramurra and Kiandra) and the Snowy Mountain Highway. Turn off into Lobbs / Ravine Track and follow the main Track. I encountered snow from the beginning for about 8 km but be prepaired for snow anytime including Summer. You will see from the Video clip below that the snow driving can be easy. But at this point of the track, a snow plow had cleared the road and it was easy, but only for about 2 km to the lookout. After that it was snow bashing. PACK WARM GEAR. (In this Track File, I have gone into some of the popular camping spots available but by all means, not all of them). Its a fairly east track but care must be taken as it is narrow and winding. Ravine is about 15 km along this track. Ravine was a small mining area and there is still some mines in the area although, they are covered over with large wire cages which you can stand on to view. There are some really good camping and fishing spots here and you will want to spend a few days here. Heading on along the track you will come to the old ruins of the Washington Hotel which was a Mud Brick affair. There's not much left of the Hotel but it is interesting. Immediately after the Hotel ruins, you will cross the Yangarobilly River (about .5m deep) which is very easy as it has a solid floor.After crossing the river, there are a few good camping spots on the Left. A little further on at s35°775647 e148°384609 you will come to a track on your Left which leads 400 meters to Lobbs Hole on the Talbingo Dam, which has a boat launching area and good for fishing. Continue on the main track and eventually you will come across a sign indicating &quot;Authorized Vehicles only&quot; Blue Creek Fire Trail to your Right. Take this track to your Right for a short distance, where a little further on is another track to your Right but you continue straight ahead on Yans Crossing Fire Trail and you will come to the ruins of the Jounima Homestead at s35°42.258' e148°26.013'. Backtrack from here to where you rurned off and go straight ahead. A few Km on , you will come across a small Parking area on your Right where you can choose to go for a hike to some other old Homesteads if you wish to do so. Continuing along the track, you will eventually come out on the Snowy Mountain Highway. Turn Left to go to Talbingo and Tumut. Or Right to go to Kiandra and Cooma. For those who are into Geocaching, there are a few Geocaches along this Track. Anyone else who would like to try Geocaching (Finding Treasures) will have to register to play. (FREE) http://www.geocaching.com You can find me registerd here as watchdog05. I last drove this track in September 2010 and had to turn back because of bad weather closing the track. I also done (or tried to) the trip in the opposite direction.